In July 2000, the National Commission on Terrorism (the "Bremer commission") recognized that a shortage of trained linguists undercut U.S. security. In its final report, the commission stated, "All U.S. government agencies face a drastic shortage of linguists to translate raw data into useful information. This shortage has a direct impact on counterterrorism efforts." More than four years after the Bremer commission issued its recommendations—and after the terrorist attacks of September 11, 2001—how much progress has been made in rectifying this broad and crosscutting translation problem? While congressmen, journalists, and pundits focused on The 9-11 Commission Report, the Department of Justice's Office of the Inspector General quietly released another report, portions of which are excerpted below, highlighting the FBI's continuing difficulties with speedy and tactically-effective foreign language translation. The Office of the Inspector General found that while the FBI has increased its linguist staff by more than 300 since September 11, 2001, 20 percent of all material gathered in surveillance operations is still not translated. Although the FBI translates almost two-thirds of taped conversations between suspected Al-Qaeda members within twelve hours, over 20 percent of these take more than a week to be translated, and some sessions sit on the shelf for longer than a month. Difficulties in hiring linguists continue with fewer than 10 percent of applicants ultimately hired. Even with proper staffing, organizational impediments continue to handicap the counterterrorism process. Because the FBI does not properly prioritize surveillance recordings, translators often tackle lower-value recordings even as some crucial ones are not translated. As these backlogs of translation mount up, the Middle East Studies Association (MESA), the professional organization of Middle East academics, has announced that it will not accept advertisements in its bulletin or journal from "defense and intelligence related agencies"—and this despite the MESA scholars' significant reliance on taxpayer funding. Excerpts follow from the redacted and unclassified version, dated July 2004, of the executive summary of the inspector general's report, including its original footnotes.—The Editors. Prior reviews of the FBI's Foreign Language Program revealed severe shortages of linguists that resulted in the accumulation of thousands of hours of audio and videotapes and thousands of pages of text going unreviewed or untranslated. As the FBI continues to focus its priorities on counterterrorism and counterintelligence, it must rely heavily on linguistic capabilities for interview support and surveillance activities. The FBI's linguists play a critical role in developing effective intelligence and counterterrorism information. Linguists are the first line of analysis for information collected in a language other than English. Linguists must use their judgment in filtering the information to ensure that information of potential intelligence value is passed along to agents or analysts. Linguists must sort through the thousands of hours and pages of intercepted telephone conversations and documents to identify pertinent foreign intelligence information. Information of intelligence value is often subtle because the parties to the conversation may suspect they are being monitored. For example, linguists must be able to recognize coded words or the implications of a conversation when the parties refer to issues cryptically. This requires high standards of language proficiency and cultural knowledge. The FBI's approximately 1,200 linguists are stationed across the United States in fifty-two field offices and headquarters. They are connected via secure communications networks that allow a linguist in one FBI office to work on projects for any other office. As of April 2004, the 1,200 linguists consisted of about 800 contract linguists and 400 language specialists … According to the FBI, contract linguists assigned to counterterrorism and counterintelligence matters work an average of twenty-nine hours per week. FBI officials told us that the lack of contract linguist full-time availability can disrupt the normal course of investigations and an office's ability to monitor FISA lines on a near-live basis. 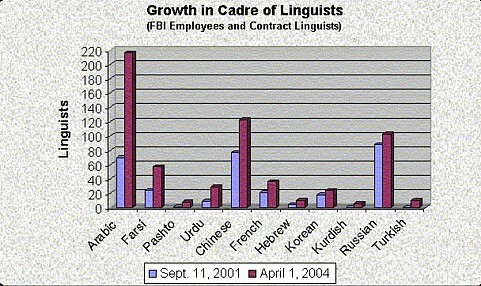 Since September 11, 2001, the FBI's Foreign Language Program has experienced a large influx of funding and linguists. Language program funding increased from $21.5 million in fiscal year (FY) 2001 to nearly $70 million in FY 2004; the number of linguists has grown from 883 in 2001 to 1,214 as of April 2004. According to the FBI, its linguist growth occurred at the maximum rate that the FBI's congressionally earmarked funding would allow. As shown in the following chart, the FBI has increased its linguist capabilities in languages associated with counterterrorism and counterintelligence activities. Source: FBI Language Services Section. After the terrorist attacks of September 11, 2001, the FBI director stated that the FBI needed to change from an agency primarily focused on investigating crime to one whose primary focus is the prevention of future terrorist attacks. The FBI's change in focus shifted agent investigative resources to counterterrorism and counterintelligence programs heavily dependent upon electronic surveillance collection. The FBI's collection of material requiring translation has continued to outpace its translation capabilities. In fact, despite the infusion of more than 620 additional linguists since September 11, 2001, the FBI reported that nearly 24 percent of ongoing FISA counterintelligence and counterterrorism intercepts are not being monitored. At a news conference with the attorney general on September 17, 2001, the FBI director announced the FBI's critical need for additional Arabic, Farsi, Pashto, and Mandarin contract linguists. According to the FBI, more than 20,000 applications spanning the foreign language spectrum were received by its on-line employment application collection system within the next thirty days. The FBI estimates that the contract linguist vetting process eliminates over 90 percent of the applicants processed for hiring. The ratio of contract linguist applicants selected for processing to hires is as follows: FY 2002—one hire for every 14 applicants; FY 2003—one hire for every 13 applicants; first half of FY 2004—one hire for every 19 applicants. For those applicants who pass the vetting process and are hired, the applicant processing cycle is about thirteen months. In addition to hiring difficulties, we also found that system limitations contributed to the FBI's backlog of unreviewed material. The FBI's digital collection systems have limited storage capacity. Because of this, audio sessions resident on a system are sometimes deleted through an automatic file deletion procedure to make room for incoming audio sessions. Although sessions are automatically deleted in a set order, we found that sessions which are unreviewed are sometimes included in those that are deleted, especially in offices with a high volume of audio to review. Because these sessions have not been reviewed, they will continue to be reflected in backlog statistics. The FBI has been aware of problems regarding audio sessions being automatically deleted and the inability of the digital collection systems to identify or quantify the volume of deleted audio. Yet, necessary system controls have not been established to prevent critical audio material from being automatically deleted ... The results of our tests showed that three of eight offices tested had Al-Qaeda sessions that potentially were deleted by the system before linguists had reviewed them. Source: OIG developed from FBI digital collection system data. Because the FBI does not have the ability to translate all of its foreign language material, the manner in which the FBI prioritizes its translation workload is critically important … We found that the FBI is not providing sufficient operational information to the Language Services Section to enable it to effectively prioritize the FBI's translation workload. For example, as of June 2004, the Counterterrorism Division had not provided the Section with information identifying the relative priority of all its cases … requiring foreign language support. Further, the FBI had not provided the Language Services Section with a complete list of Al-Qaeda FISA case numbers so that it could ensure near-live monitoring of those lines. We found that the foreign language program has not prioritized its workload nationwide to ensure a zero backlog in the FBI's highest priority cases—counterterrorism cases and, in particular, Al-Qaeda cases … The existence of Al-Qaeda backlog in any office indicates a need for closer monitoring by the Language Services Section so that this work can be redistributed to other offices, if needed, to ensure its timely translation. Countering the Changing Threat of International Terrorism, National Commission on Terrorism, July 13, 2000. The 9-11 Commission Report (New York: W.W. Norton Co, 2004). The Federal Bureau of Investigation's Foreign Language Program—Translation of Counterterrorism and Counterintelligence Foreign Language Material, report no. 04-25, Redacted and Unclassified (Washington, D.C.: Office of the Inspector General, July 2004). "Advertising," Middle East Studies Association, Nov. 30, 2004, accessed May 21, 2005. For example, more field offices are pursuing the Title III (criminal) surveillance technique versus the Title 50 (FISA) surveillance technique. Even though a case may be captioned as a counterterrorism investigation, the Title III investigative technique has inherent legal requirements that preclude the Foreign Language Program from using its distributive nature of work processing. As a result, the Foreign Language Program has had to detail linguists to various offices, sometimes for months at a time, in support of Title III investigations. In addition to electronic surveillance (Titles III and 50), the Foreign Language Program is routinely asked to provide on-site foreign language support in the execution of search warrants, interviews with subjects, and polygraph examinations. In addition, over 1,000 special agents and analysts complement the FBI's core linguistic capabilities with foreign language proficiencies at the minimum working level or higher. However, according to the FBI, few of the agents and analysts are ever available to support the Foreign Language Program in a linguist capacity. The FISA Statute provides legal standards related to wiretapping against foreign powers and agents of foreign powers in the United States. According to the FBI, nearly all of the intelligence derived from the FBI's use of the FISA authority is in a language other than English and must be translated. The FBI defines near-live basis as within 12 hours. However, $38.5 million of the $70 million in FY 2004 funding came from a supplemental appropriations bill, and only $9 million will recur in FY 2005. Moreover, funding statistics do not include available funds for FBI language specialist salaries and benefits. According to the FBI, language specialist salaries and benefits totaled $30.7 million in FY 2001, $33.6 million in FY 2002, and $37 million in FY 2003. According to Language Services Section hiring statistics, from September 11, 2001, through April 1, 2004, the FBI hired 626 linguists—548 contract linguists and 78 language specialists. However, considering attrition during this time frame, the net increase in linguists as of April 1, 2004, was 331. The contract linguist vetting process includes language proficiency testing, a personnel security interview, a polygraph examination, and a background investigation. Only upon the successful completion of all stages of the vetting process are contract linguist applicants approved and granted a top-secret security clearance. We provided the results of our prioritization tests to the FBI. The FBI commented that all Al-Qaeda cases do not necessarily represent the FBI's only high priority matters. For example, counterterrorism related cases pending prosecution in court often pull tremendous levels of linguist resources from one high priority matter to another in which much more effort must be expended in support of the prosecution. Verbatim translations, reviews of existing translation, and court testimony frequently require months of support by the FBI's most proficient linguists. Related Topics: Counter-terrorism | Summer 2005 MEQ receive the latest by email: subscribe to the free mef mailing list This text may be reposted or forwarded so long as it is presented as an integral whole with complete and accurate information provided about its author, date, place of publication, and original URL.